Two years ago, Gretchen Plotner was visiting her son in Florida when her left knee started going out. She and her husband, Les, came home early and made an appointment with Rodney Herrin, MD, an orthopedic surgeon with the Orthopedic Center of Illinois. X-rays revealed there was only a small amount of cartilage remaining in her left knee. To improve her strength and mobility, Gretchen started physical therapy with the Rehab Services team at Abraham Lincoln Memorial Hospital. Gretchen underwent a right-knee replacement. She spent three days in the hospital recovering before going home. As a knee-replacement patient, Gretchen received care through the hospital’s joint replacement program, now Memorial JointWorks. Recently introduced at ALMH, Memorial JointWorks was developed and introduced at Memorial Medical Center in Springfield nearly 10 years ago. The program is designed to build a partnership between hip- and knee-replacement patients and their healthcare team. Patients and their families attend an education class to learn exactly what to expect before, during and after their surgical procedure. With evidence-based plans of care and a personalized, aggressive therapy approach, the multidisciplinary JointWorks team helps patients reach their goals of decreased pain, maximized function and mobility, and an overall improvement in quality of life. To increase range of motion, Gretchen’s team had her concentrate on exercises to improve function, regain strength and assist walking and balance. She spent time on the center’s new sitting elliptical, the Octane X-ride, a machine that caters to knee-replacement patients and made possible by the Abraham Lincoln Healthcare Foundation. Patients typically receive treatment two to three times a week for about four weeks. But exercises must continue once the patient is home. Each year, nearly 1,500 people undergo hip or knee replacement surgery through Memorial JointWorks. Now that it has been incorporated at ALMH, Mourning expects that number to rise. “I think we’ll reach an ever wider variety of people and really make a difference in Lincoln and Logan County,” he said. It has certainly made a difference for Gretchen. The retired jury commission clerk can now do everyday activities around the house and town with ease. Eventually she will have her left knee replaced as well. But for now, she’s enjoying life and taking it one step at a time. 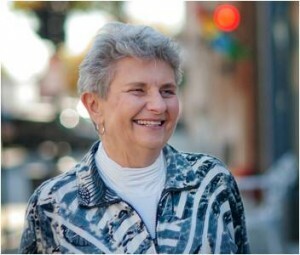 Gretchen’s story is one of many featured in the 2012 Memorial Health System Annual Report. Visit ChooseMemorial.org/AnnualReport to read more patient testimonials and highlights from the past year.